No matter how likable you are, everyone is bound to make an enemy in life. Each person has a different approach to dealing with someone that they do not get along with. Here is how you might respond to an enemy according to your personality type. Although INFJs can be extremely warm, and tend to avoid harming others, there is a flip side to them. As an enemy INFJs can be extremely manipulative and potentially hurtful. It often takes a great deal of pushing to get an INFJ to reach such a point, but it is possible. They have a strong sense of awareness, and are capable of manipulating others and seeing where their weak points are. As an enemy an INFJ may be very harmful, or they may just shut the person out of their lives as if they never existed. They are one of the most amazing types to have as your advocate, but can make a very spiteful enemy. Some of the most sinister people in history have been typed as INFJ, and also some of the kindest. They are like two sides of a coin, with the potential for greatness- either good or bad. ENFJs spend most of their time finding ways to make others happy, and caring for their loved ones. Just like every type they are capable of anger and may even hold onto grudges for a long time. The ENFJ may find themselves feeling resentful if someone they have cared for, treats them poorly for a long time. They may be quick to anger if someone hurts one of their loved ones. 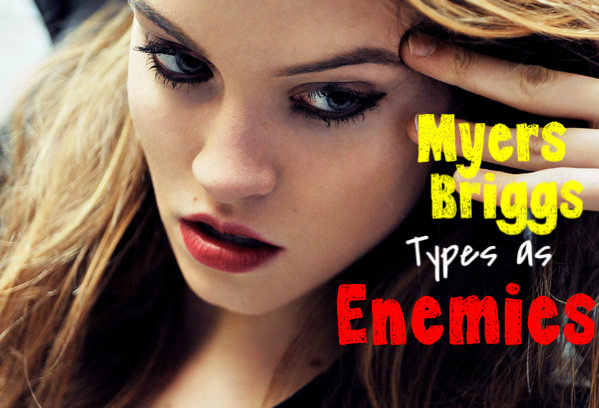 If they feel someone is their enemy the ENFJ can be very aggressive towards this person. They may find ways to manipulate others into feeling negatively towards that person as well, and are very skilled at doing so. As friends they are caring, but as enemies they can be rather frightening. The INFPs worst enemy is often themselves. They are usually harsher on themselves than they are other people. Although they tend to avoid conflict and dislike making enemies, they are capable of it just like any other type. INFPs as enemies often become this way because they see the person as dishonest or immoral in some way. Initially the INFP will probably attempt to avoid this person, and cut them out of their lives. In some cases the INFP will be very passive aggressive towards this person, and find subtle ways of dissing them. They may try to tear down their enemy’s character in front of others, so that people see exactly what the INFP sees. If they outright are aggressive towards an enemy they will probably feel very remorseful afterwards. ENFPs tend to avoid making enemies with most people, since they have a pretty high likability factor. They are very friendly and tend to avoid harboring negative feelings towards others. If someone dislikes the ENFP they will probably feel very shocked and want to try to rectify the situation. They are most likely to try to and force the person to like them, by showing them their very best. It would take a lot for an ENFP to feel aggressive towards someone or feel the desire to harm them. They tend to avoid that sort of reaction and honestly just want to get along with everyone. If it comes to a point where an ENFP feels constantly threatened by someone’s differing morals, they may attempt to turn others against them, but that is a last resort. INTJs as enemies are generally much more subtle. If they have reached a point of feeling like someone is completely against them, they will find a strategic way to attack. They often do not find the need to do this, nor do they find it useful. But if an INTJ does feel the need to make an enemy out of someone, they can do so very well. They are intelligent enough to plan a much more effective way of coming against an enemy. As friends they are logical and helpful, but as enemies that logic is used in a potentially damaging way. ENTJs can make for very aggressive and resourceful enemies. They may attempt to use intimidation to make their enemies fearful of them. They are skilled at taking charge and if need be can be very good at putting pressure on others. They probably do not see most people as enough of a threat to even consider them an enemy. If they do they are probably very upfront about it, and do not feel a need to hide their dislike of someone. INTPs are more likely to avoid someone that they dislike, and often do not enjoy making enemies. A mature INTP will find this pointless, and desire to squash the problem if possible. They are usually not afraid of someone and are definitely willing to stand up for themselves if need be. If someone is constantly causing trouble for them, they may try even harder to agitate this person in an effort to get them to knock it off. INTPs generally feel like they have much better things to occupy their thoughts than coming against an enemy. Their tendency to strive for precision can agitate others easily, but the INTP is not intending to make enemies, they just want to be precise. Being that they are natural debaters, ENTPs may make a few enemies. They are often well-liked and have the ability to change people’s minds about them. If they find they have made a real enemy, the ENTP may try to smooth things over and express to this person that they are a great person to be around. If the relationship is not fixable however, the ENTP may attempt to manipulate their friends into disliking the other person. The ENTP may continue to poke at this person if they don’t come around, which will ultimately make things worse. ISTJs tend to keep to themselves and strive to fulfill their duties. They often get along with people, and avoid unnecessary conflict. However, if the ISTJ feels like someone is encroaching in on their lives or possibly effecting their chance at a promotion, they may become angry. They are most likely to find subtle and strategic ways to overcome an enemy, instead of outright aggression. ESTJs enjoy being liked, and will attempt to avoid making enemies out of people. They are very aggressive and do have a tendency to push peoples buttons. ESTJs are rarely afraid of having enemies, and will come at the person outwardly instead of subtly. They will probably attempt to intimidate their enemies into backing down, and will find ways to make them feel physically threatened. ISFJs are very driven by their need to please others, and will avoid making enemies at all costs. They want to be well received by others, and dislike the idea of having an enemy. ISFJs may have a tendency to hold grudges for a long time if they feel someone has wronged them, but they will attempt to push it aside. Their anger may come out in passive aggressive ways, or they may use guilt manipulation. ESFJs spend most of their energy on pleasing others, and dislike the idea of making enemies. They will tend to avoid being disliked, but that does not mean they are incapable of making enemies. As an enemy an ESFJ will be most likely to shut someone out of their lives completely. If they are truly angry with someone, they will rant about them to others, but in the end will pretend like that person doesn’t exist. They may use manipulation to tear down their enemy’s character. ISTPs are extremely laid-back and rarely make enemies. They tend to keep to themselves and truly do not find the desire to dislike someone. They probably feel like having an enemy would be a complete waste of their time, and would do their best to avoid that person. If someone continued to bug them, they would probably address it honestly in an attempt to deter that person. In the end the ISTP will ignore the enemy until they go away. If it goes too far they aren’t afraid of getting physical. ESTPs desire to be liked, and usually don’t feel a need for making enemies. If they truly make an enemy out of someone, they will probably attempt to convince themselves they had no choice in the matter. They may talk negatively about that person in an attempt to deter others from liking them. They aren’t at all afraid of conflict, but in the end don’t truly want to make enemies. ISFPs are probably one of the least likely types to make enemies. They dislike conflict and keep to themselves most of the time. ISFPs don’t feel the need to hold grudges and will generally just avoid someone who dislikes them. Instead of addressing the conflict, they will probably just step away from it. ESFPs are fun loving and will usually ignore the presence of an enemy altogether. If they do feel the need to address an enemy, they may resort to petty insults and trashing their name to make them go away.